Pine Creek flows through a long straight canyon in the southeast section of Zion National Park towards UT 9, the Zion-Mt Carmel highway, where it is joined by Clear Creek, an even longer tributary that runs alongside the road eastwards through a fantastic red and white landscape of sheer cliffs and huge domed rocks. As Pine Creek flows under the highway, just before the start of the long tunnel that separates this area from the main valley, it enters a half mile section of deep narrows, which has become most popular technical slot canyon in the park. 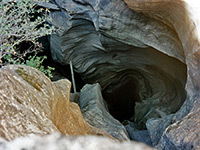 This cannot be explored without rappelling equipment since the creek quickly drops far below ground in a series of sheer falls, but for regular hikers it is worthwhile just to walk along the canyon rim and peer into the swirling depths. 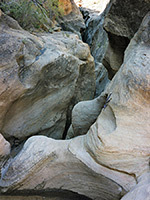 The upper end of the slot canyon may be entered by walking down the sandy banks at the far side of a small carpark just before the east entrance of the Zion-Mt Carmel tunnel, and opposite the start of the popular Canyon Overlook Trail. If the carpark is full, as is often the case, there are other places to leave vehicles a little way further along the main road. For those descending the whole canyon, a car shuttle may be needed - either that or hitch-hiking through the tunnel back to the trailhead. 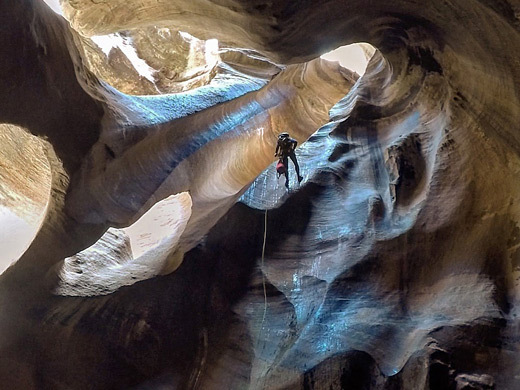 A $30 Zion National Park entry fee is required to reach this area, plus a permit for all those who rappel into the canyon (2016 fees: 1-2 people: $15, 3-7 people: $20, 8-12 people: $25) - according to new regulations introduced in 2000 and subsequently extended, this is necessary for all slot canyon exploration within the park that involves overnight back-country travel and/or rope-assisted climbing. Permits may be obtained up to three days in advance, from one of the two park visitor centers, or online. TopoQuest topographic map of Pine Creek. Pine Creek is quite interesting upstream - after a short walk from the carpark the drainage forms a deep section in which pools persist most of the year, and the long Clear Creek tributary also has many narrow places. In the other direction, the true slot canyon begins directly under the road bridge but very soon a dryfall puts an end to easy progress. 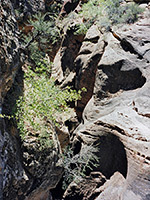 A belay point on the right indicates the only way to continue - with several long ropes (up to 150 feet) and rappelling experience all of the short but deep slot can be explored, until it opens out into a boulder filled ravine which widens further to the wide valley beneath the rock formation known as Great Arch, as the stream meanders towards its confluence with the East Fork of the Virgin River. 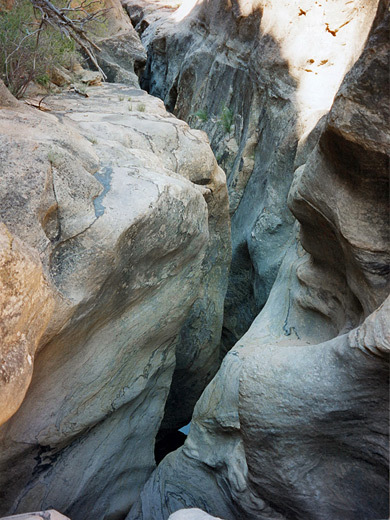 Up to six rappels are required, plus downclimbing over several chokestones and at least one swim through a 50 foot long pool of water (except maybe during long, dry periods in midsummer) that remains icy cold all year, but Pine Creek is a good place for beginner canyoneers as it is easily accessed and closely monitored by the NPS. A fine overview of the slot can be obtained by walking along the Canyon Overlook Trail, high above the narrows.